When I first met Sarah, she was close to 75 and had been experiencing debilitating pain for decades. But, since her spine x-rays revealed only normal degeneration consistent with her age, I set her to work on the DOC process. After about a year of working diligently through the tools, her pain all but disappeared. Then someone told Sarah she was losing her mental capacities. I explained that several studies had revealed that brains shrink in the presence of chronic pain, but re-expand when the pain abates. (1) I encouraged her not only to continue using the DOC tools, but also to re-connect with prior interests. Over the next six months, her depression lifted and she became more energized and interactive. She also regained much, if not all, of her alertness and reasoning abilities. Instead of focusing on dementia, she had re-set her sights on moving forward. 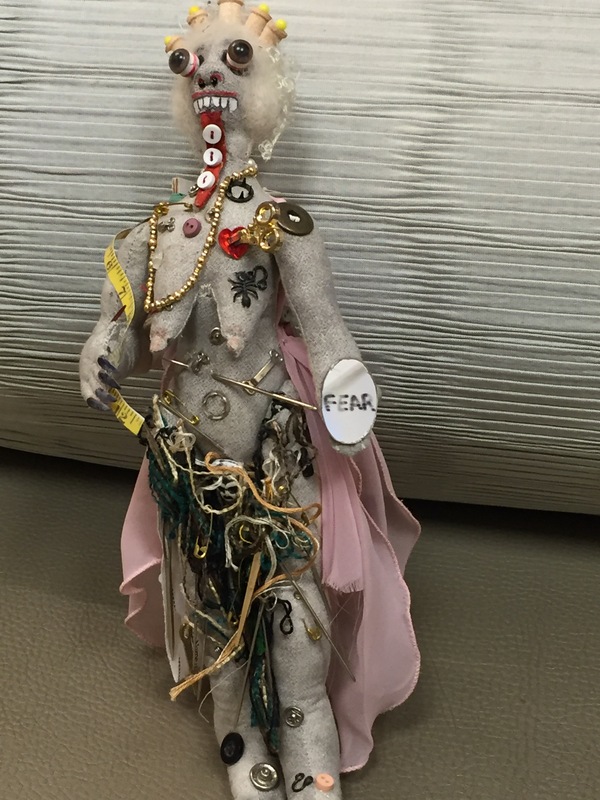 At one point Sarah brought in some dolls that she had created over the years as a therapeutic tool in her recovery. 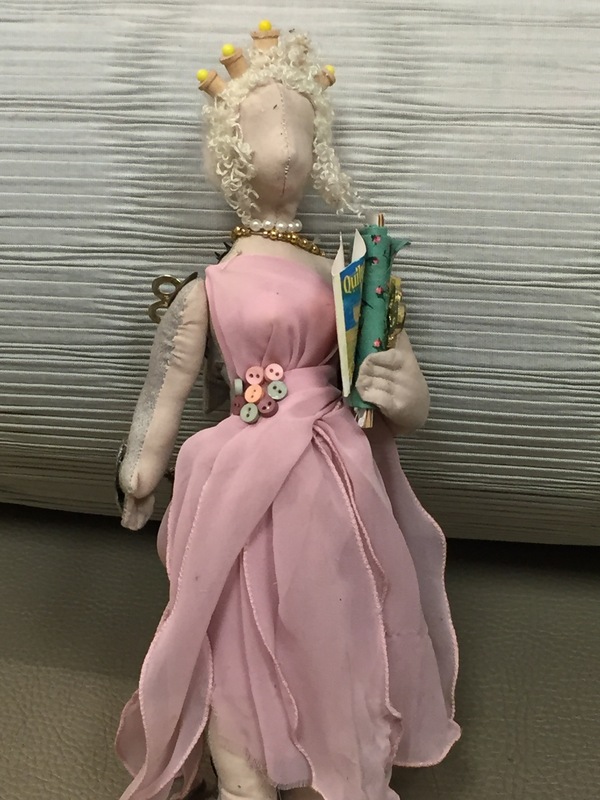 I asked her to write a letter telling the fascinating story of her dolls, so that I could share it with you. Some time ago you took pictures of my “emotional dolls.” I had shut down physically and emotionally, lost in pain and fear. I had forgotten all the biofeedback training that had helped me years before, and could not escape my desperation. I had no purpose, no reason to live. It was then my physical therapist referred me to you. Your program set me on the right track. We all have our hurts, some more tragic than others. By telling my story I can be proud of turning suffering into achievement. When I was in my late 20’s I began to have severe headaches on the left side of my head. My family doctor diagnosed migraines, taught me about food triggers and exercise, and prescribed Imitrex. But the pain became so bad that when I wasn’t hoping that God would take me, I considered getting a lobotomy or going anywhere in the world that could rid me of this. When the number of debilitating migraines reached 4 – 5 per week—sometimes landing me in the hospital for days at a time—my family doctor sent me to the Diamond Headache Clinic in Chicago. Dr. Seymour Diamond used a multidisciplinary approach that included biofeedback therapy, cranio-sacral work, and yoga. Through nutritional counseling I learned more about food triggers. Whenever I sensed a migraine coming on, I retreated to a dark room. But no matter how much I tried, I could not ignore the terrifying, head-eating monster behind the left side of my head, ready to stick its fangs into my left eye. While I was visualizing the monster, I remembered a visit to the Milwaukee County Museum. At a Far East exhibit was a frightening, human-sized doll with huge teeth, a dangling tongue, bulging eyes, hanging breasts, and skulls in its hands. That was my monster, I thought. That is what my migraine looks like. Then I had an idea. 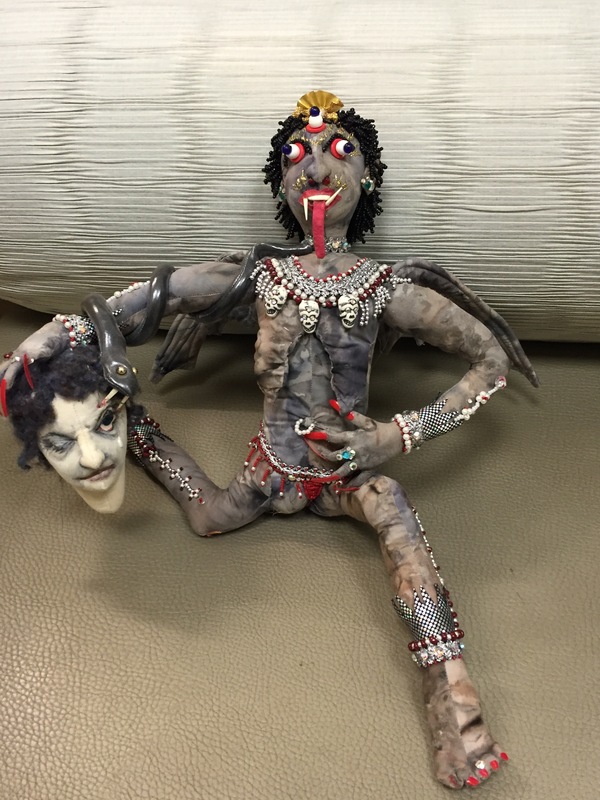 What if I sculpted a doll that looked like the hideous monster that sits behind my left ear? 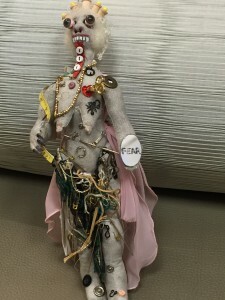 I began to create a doll out of cloth. When I was done, I hung it in my sewing room where I could see it every day. Now this doll, not I, contained all the migraine pain I ever experienced. It could not hurt me—it was only a doll. If got a mild migraine, which I did about once or twice a year, I remembered it was not my migraine, but the doll’s. I was free and immensely grateful to Dr. Diamond for giving me tools to live a pain-free life. When I was in my 30’s, The Boeing Company hired my husband as an engineer and me as a draftsperson. Life was remarkable with no pain. I stopped using Dr. Diamond’s biofeedback techniques but embraced a rigorous physical fitness regimen. I became a serious triathlete. Every day I biked to work, ran during my lunch hour, biked to a gym and lifted weights or went swimming for an hour or two in the lake across the street from my house. By my 49th year, I had a good job with a promising future and won most of the races I entered. I was elated to have been accepted to the Ironman Kona Hawaii Triathlon Championships, a 140.6-mile race. I had all summer to train, and I trained hard. One day I rode my bike to Bellevue, Washington, to join some other bikers on a 100-mile training ride. When I got to the meeting place, a hotel parking lot, my wheel caught a hole in the driveway. I cantilevered over my handlebars, hitting my head on the concrete, and passed out. When I woke up, emergency personnel were all around me, cutting my brand new $65 biking sweater off me. Badly injured, I was put in an ambulance and taken to the hospital, where I had a neck surgical fusion and a wrist reconstruction. The pain never went away. Eventually I had two-level fusion through the front of my neck. I lost all that identified me—my job and the ability to run, swim, and bike. I found it difficult to do most tasks. All my friends were athletes, so we no longer had anything in common. After a while I stopped seeing them. The only people I saw were doctors and physical therapists. I saw no sense to life, no purpose, and felt nothing but the prospect of one surgery after another. My suffering had no limit: If one day was bad then I knew the next would be worse. I had fallen into a dark pit, an uncharted underworld of loneliness and despair. It was time to sew another doll. I visualized a two-sided face with features on both sides. On one side was the person I wanted others to judge me by. The opposite side showed who I thought I really was. On this side I jabbed a pair of scissors in my heart and put a mirror in my hand that reflected the word “Fear.” I pierced “my body” all over with copious amounts of needles and other sewing notions, to represent the pain that I had endured for the last 20 years. Today I am doing well. Dr. Hanscom, thank you for all the training. On the few days I start to slide back into the darkness, I can find my way back to loving myself. Life is potentially meaningful under any conditions. What matters is the capacity to turn life’s negative aspects into something positive and constructive, to make “the best” of any situation. Just focus on all the beauty that surrounds us. 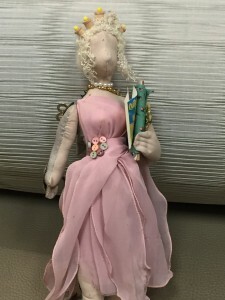 Dolls, as objects of our creative imagination, will, if we invite them, take us to play again in the house of our childhood past and perhaps bestow upon us a future we hadn’t imagined. Sarah’s story illustrates several aspects of successfully treating chronic pain, which include: 1) de-adrenalizing your nervous system 2) creating new neurological pathways 3) shifting back on to enjoyable ones. Why is mental function compromised in the presence of chronic pain? First of all, the stress hormone, adrenaline, decreases the blood supply to your brain’s frontal lobe. Second, obsessive thoughts cause the brain to get stuck on a few repetitive circuits, making them more imbedded, blocking your creativity, and causing portions of your brain to be under-used. The most tragic part of this sequence is that, with this diminished brain function, you are less willing and less able to learn new ways to heal. In other words, the pain blocks its own treatment. Not only is Sarah doing well, she emanates joy. She is mentally sharp and moving forward quickly with her life. It has been a remarkable experience for me to witness this transformation. Seminowicz DA, et al. “Effective treatment of chronic low back pain in humans reverses abnormal brain anatomy and function.” The Journal of Neuroscience (2011); 31: 7540-7550.